Arrive to work after battling 1hr15 mins in traffic. (Exhausted already and haven’t even started work). The main duty of the dental nurse is to assure the highest standard of care for the patients we treat. The day begins with firstly preparing and ensuring Dr Seymour’s glasses, light and battery are ready for the day’s events. His glasses have magnifying lenses with a special head lamp. Dental work now is measured in parts of a millimetre, so see better do better. Meanwhile Dr Seymour is on the line before 9.00am asking if there are any messages for him or things that need to be dealt with before he arrives. While preparing his coffee, to get him going, we are undiverting the phone from the paging service and check for messages on email. We then check the pager for messages and attend to any calls received out of hours. Then there is the turning on of the compressor, x-ray machines, both autoclaves, all monitors and computers. We also set up dental materials and make sure the day sheet is printed and up to date, until we receive the call to go to the parking lot to help him with his bag… (Because they’re so heavy to carry as he carries his office with him). In the sterilising room we next we prepare the Helix test to check that the autoclaves are functioning properly. This is tested using a hollow tube to check that steam under pressure goes all the way down it. This ensures that all the hollow instruments, such as hand pieces, will be sterilised by the autoclave. This normally takes at least half an hour for the cycle to run for each machine. Following this we de-gas the ultrasonic cleaner and prepare the instrument soaker. The ultrasonic shakes the instruments of debris before going into the autoclave. The de-gas ensures that it functions properly before we load it with instruments. From there we remove the instruments from the steriliser that were done overnight and we check that all indicators have changed then label, scan and record into the computer. This enables a traceable barcode to be placed on the instrument packs. 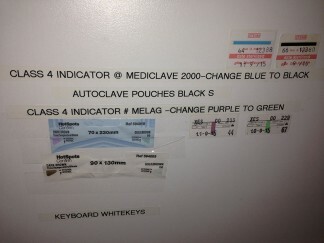 This code is entered into the computer to the autoclave log. When the instrument is used the same unique barcode is scanned into the patient’s notes. However, a label called a Class 4 indicator that was placed on the pouch, before sterilising, is checked to ensure it has changed colour. Inside the autoclave a more robust Class 6 indicator has been placed to check the autoclave has reached the correct temperature and pressure. This also needs to be checked and recorded. We do a lot of recording to prove what we have done! 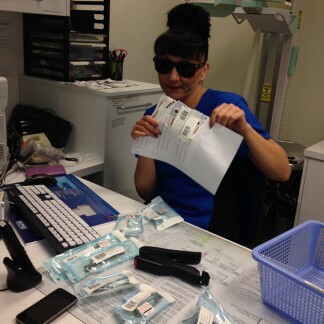 The dentist also has to check that the indicators on the bag have changed colour BEFORE we open the pouches to get the instruments and hand pieces out and scan the barcodes into the patient notes. Infection control is very important to us! During this period we are also assisting in the surgery and checking on the patients from the previous day that the dentist wants us to check on to make sure they are ok after their appointment. This has only been the first hour of the day.